Curly girls know a lot about volume, and while some embrace it others find it distracting and wish to lose it. 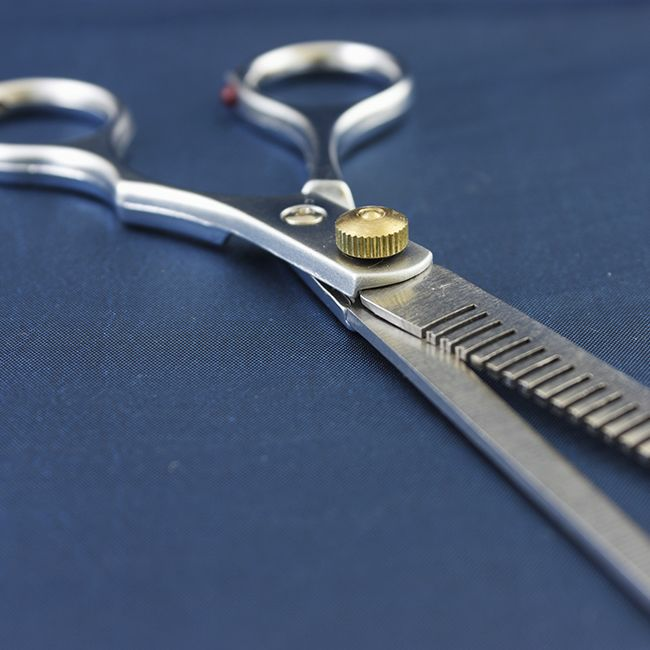 One popular solution for removing bulk from curly hair is the use of thinning shears. However, thinning the bulk can often create a larger issue with uneven curls, frizz or lost curls, and for drdi in Curly Q&A it ended in a disaster. Hairdresser used thinning shears-DISASTER! Help! A week ago I had a haircut not to my regular hairdresser. My curls were feeling a little bit heavy, so I asked him to do something to control that. He used the thinning shears. It was the first time this is done to my hair, and I didn’t have any idea of how bad it is. Now most of my curls are gone, other parts appear straight (especially the front close to the face) and there are some very thin ringlets. Also, after the haircut, I noticed that my hair become oily very easily, something that was not happening before. How long does it take to get back to the previous condition? What should I do to improve it? Would it help to cut my hair a little bit? I have been in your shoes and it took forever for my hair to grow back into a style that allowed me to feel good about my hair again. In all fairness, I had no clue what I wanted or how I needed my hair to create a style, but what I got was not it! It ruined my curls, my fullness, and my ends. Needless to say those slicing and thinning cuts are not ideal for all curly girls, but I have some tips that may help until your hair grows out. You can find a stylist who specializes in the DevaCut to help rescue your curls. They are not gone forever but a professional may need to step in to fix the problem. I am a big proponent of the DevaCut but let me tell you why. First off, the bad cutting experience I had allowed me to find out what I did not want nor worked well for my hair and secondly I have had two DevaCuts and they were marvelous. The DevaCut is a specialized cut for curly, coily, and wavy hair that focuses on sculpting each curl without disrupting the curl pattern. Stylists are extensively trained to learn this technique. The cut is done on dry hair since curly hair is very different when wet. This cut is excellent for the curly girls who love the wash and go style. There are more cutting styles other than the DevaCut that work just as well if not better and it really depends on the client and the style they are going for. There is the RI CI Cut by Edgy salon owner, stylist, and educator Ricky Pennisi, which is based on hair weight and density and not curl pattern. While this cut has a different premise, they concentrate on the problem area to create movement and allow your curls to be frizz-free and beautiful. Again, go for a consultation and see if they can fix your cut prior to making the appointment. You can pin up or roller set the hair that refuses to curl or try braid outs or twist outs to get all the hair to curl homogeneously. Applying a holding product while scrunching those pesky strands to get them to curl may help as well especially if it is only a few sections unwilling to cooperate. So you can achieve uniformity in your hair by curling it or you can seek out a professional in curly hair and curly cuts. Make sure to have a consultation so the stylist can see your hair and determine the course of action. Take your time finding the right person and know that whatever route you choose to take your hair will grow back and your curls will return. Have you ever had a bout with the thinning shears?